Traditional Series : The CambridgeThe Cambridge has been improved and now comes standard with a fullchaise pad! The Cambridge PR401 features a plush, overstuffed "biscuitback" design for long, restful hours of relaxation and sleep. TheCambridge comes in Golden's exclusive SofTouch(TM) fabrics in Cognac,Sage, Sapphire, Mulberry and Rose.Let Golden Technologies take all the worry out of purchasing alift/recliner. Our expert craftsmen blend the finest components withsuperior designs to provide you with the utmost quality, comfort andstyle. We confidently stand behind all our products and provide youwith the best warranties in the industry. 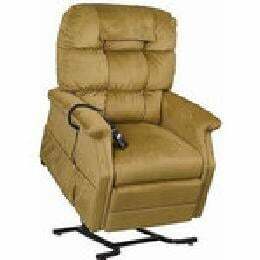 Choose the lift/recliner thatall others are measured against...choose Golden! Product Details Contemporary Design Deep Seated Comfort with Ultra Soft Back Simple Two Button Control Easily Raise to a Standing Position Gently Lower to a Seated Position Recline for Extra Comfort "Full Napper" Position Superior Leg Extension SmartTek™ Inside - Patent Pending Diagnostic System Meets California Safety Code: Cal 117 Non-Skid Leg Levelers for Extra Stability and Safety Easy Access Battery Back-Up System Best Warranty in Industry Lifting Capacity: 375 lbs.